My name is Steve Schmidt, and I work with a ministry called Love Packages. Today I’m going to give you the nickel tour. First of all, let me tell you what we do. We collect used Christian literature from all across the United States and Canada. We sort it, pack it, and ship those things overseas. Most of the people around the world have nothing, and so this is very valuable material for them. Anyway, we’ll start here in the tour. This is today’s mail. We get about six and a half tons of mail a week from all over the country. If you look at the addresses on here, you would see from every state, you know, Pennsylvania, California, Iowa, and so on—Puerto Rico, Virgin Islands, Canada, all coming in. This is carry in, we have people that collect for us in different places across the country—in Ohio, Kentucky, Tennessee, and Indiana, etc.—and they bring stuff into us. So all this is the carry-in and as you can see we’re just a little bit behind. This is our sorting area. Everything that you saw over there, all the mail, and all the incoming material has to come here. We sort every piece and make sure it’s good. We take out all the Good Housekeeping magazines, all the love letters, all the electric bills, all the cult material, all those kind of things. We take all that out. So we sort it to make sure that it’s good before we send it overseas. We sort in six different categories. When they get sorted—this is a Bible bin here—it gets put here. Then, when we get volunteers that come in, they pack these materials and they mark it with a color. That [color] will tell the people on the other end what’s inside that box without having to open all the boxes. This one’s got green dots on it, so it’s Sunday school literature. Here’s one that’s got black dots on it, so it’s Bibles. This one’s got cassettes videos in it, and this one’s got books in it. So that allows the distributors, when they get 20 tons of literature at time, overseas that they don’t have to open a bunch of boxes to find out what’s in them. They just look for the spots. We’ve saved the last five years in the most common Sunday school curriculum that we get. 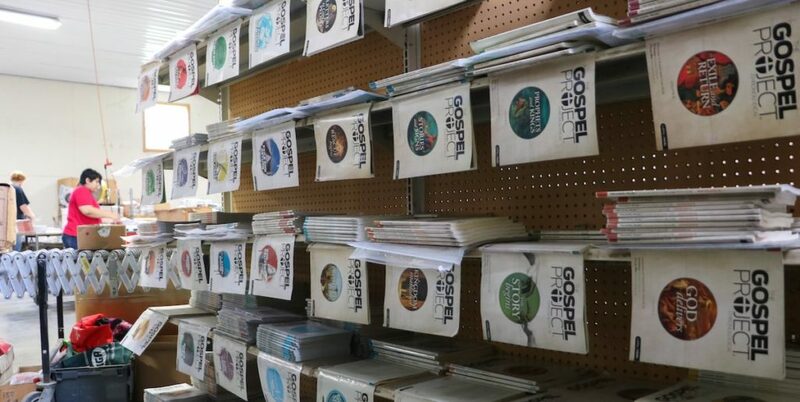 And so when we get [individual Sunday school booklets] we’ll put it on the shelf until we get enough to make a class. Then we’ll pull it off and we’ll make a class set. This section here is what we get from major publishing houses. We get donations from eight major publishing houses—all the leftover Sunday school materials. Material comes in like this—this is all from Union Gospel—and it comes in a big container like this. This material is from the Assemblies of God. We’ve got the strapping machines [to band together classroom sets of Sunday school material]. Now, that’s ready to be shipped overseas just like that. But we might have other things, you know, we have teachers’ [books], and packets, and students’ [books], and so we have to match that up the right way in order to make packages. We get things not only from the Sunday school publishers, but from ministries. These books here in the corner are all from the Billy Graham Association. Twice a year at least we get two or three tractor-trailer loads from them of outdated things that they’re not gonna use. And so again, we use these strapping machines to make packages like that so we can ship them. This is from Pilgrim Tract Society over here. That’s 15 million tracts and we will ship them not to one person, but as we ship loads out, we ship a little bit here a little bit there. All these boxes that were done in the sorting room go on this conveyor and down the line. That’s our new warehouse we had to build and we’re gonna take you down into the shipping warehouses. Everything comes down here when it’s done and then it gets shipped overseas. When the packages get down here they’re offloaded onto a palette. We palletize it all and then it comes over here to get staged for a particular load. You can see everything from here over is done, ready to be shipped overseas. This whole section here, and some material out there, is all gonna go on the load Thursday to Nairobi, Kenya. Then this section here is gonna go on the next load, on Friday, to India. Every week, we ship 20 tons of literature out that door. So we stage two or three loads in this warehouse on a continual basis. Back here in the corner, we have Spanish literature, and we’re staging a load that’s gonna go to Ecuador in about three weeks. In this section over here, all this material is coming in from ministries. So this roll here is all coming from the Billy Graham Association. This roll here is all come from the 700 Club. That roll there has come from Radio Bible Class. When we get ready to send a load, since this product is all the same, we come through here and we’ll pull from this line. We’ll pull two two, three, or four from each one, and put it on a skid to piecemeal it out until this is gone. This year, we are going to ship at least 1000 tons of literature around the world. Now, what is that? That’s enough literature for 50 million people to read the first time. The people that do the statistics tell us that every piece of literature we put on the field is going to be read by a minimum of 20 people. And so this year we’re going to send a billion reads. What is that going to do? I don’t know. But I do know this: that God has promised in His word that His word won’t return to him void, but it would accomplish the thing that He’s purposed in His own heart. And so we do it by faith. We send those things all around the world and we see tremendous results as a result of it. Men and women, boys and girls, giving their lives to Christ—being saved, healed, delivered, their lives changed, churches grown, and if you wanna see a little bit of that you can read thousands of testimonies on our website. In our third building we have a dormitory upstairs that sleeps 32 and one downstairs that sleeps 10. We have eight showers plus kitchen facilities. You can come and spend the day with us—or a week with us—and you can help us work and prepare materials and get ready to ship it overseas. It’ll make an eternal impact. You can bring a missions group or missions project and it’ll be a great time for your youth, or your women’s group, or your men’s group. Well, that about concludes our nickel tour. I’m not gonna charge you a nickel: you can just put that in the offering next time you go to church. If you want a brochure from us, you can contact us and let us know. We appreciate your kindness and your help. We also have a lot of online resources to help you organize a bible collection or just share the ministry of Love Packages on social media.